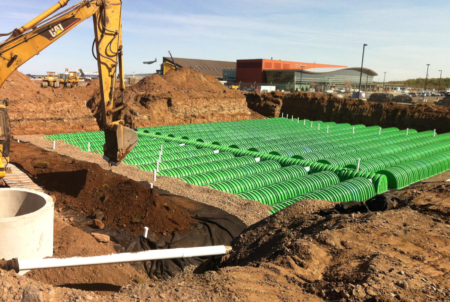 The Triton stormwater system is suited for subsurface stormwater management including infiltration, retention, detention and conveyance. 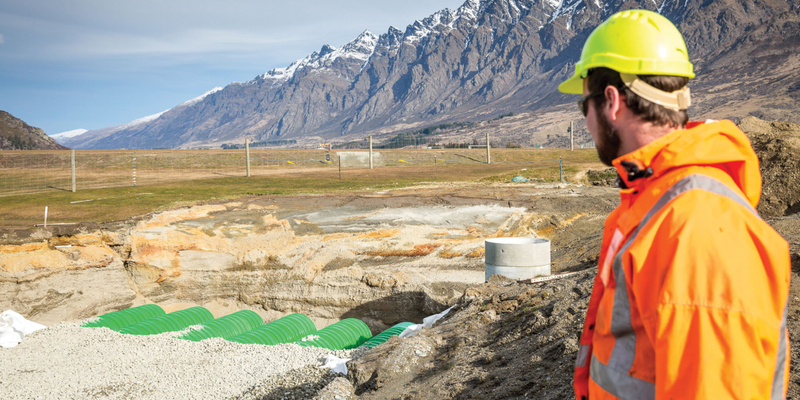 It is essential to properly contain sediments, contaminants, and surface runoff in order to meet environmental regulations and create world-class projects. 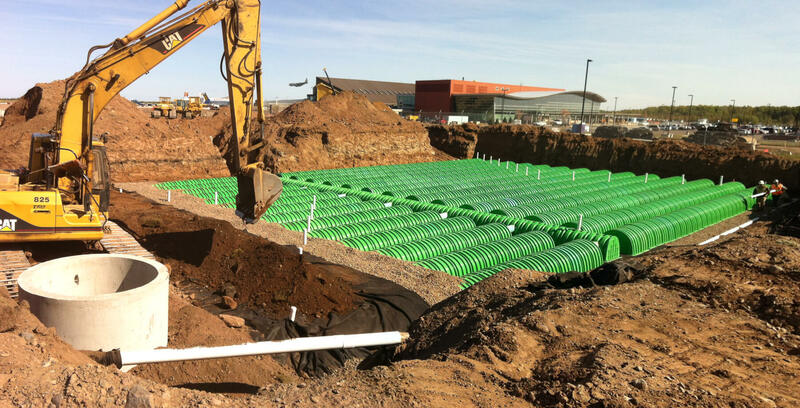 The Triton stormwater system offers developers the tools they need to meet these demands with an easy to use underground system that saves time and money. This system combines eco-friendly materials with an ultra-durable yet lightweight design that is easy to install and maintain. It also saves on space, as the chambers can be double-stacked in many applications, reducing the footprint. The chambers, constructed from soy based resins, are easy to handle and set into place. The interlocking design allows for a quick connection to the chambers to create the required row lengths. 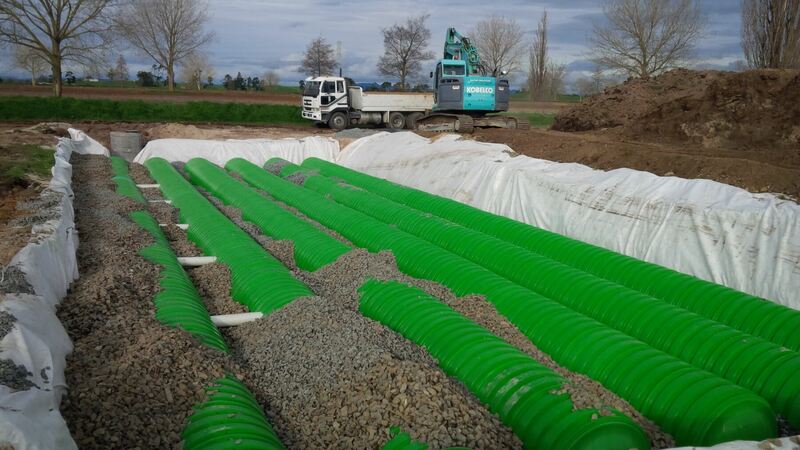 Their strength allows for speedier backfill rates and shallower depth requirements than competitive products. Triton chambers compare closely to traditional pipe products but at a fraction of the weight. The design of this system is designed to simplify routine maintenance. 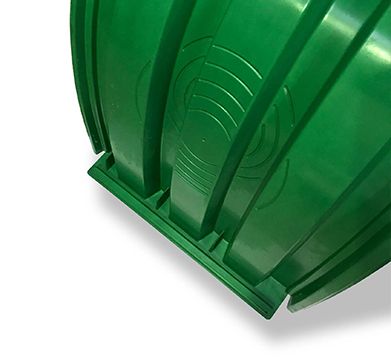 Utility holes in the sump basin and on the Main Header Row allow maintenance personnel simple access points to inspect the system and maintain it if necessary. The innovative distribution dynamics of the Main Header Row result in significant maintenance reduction. 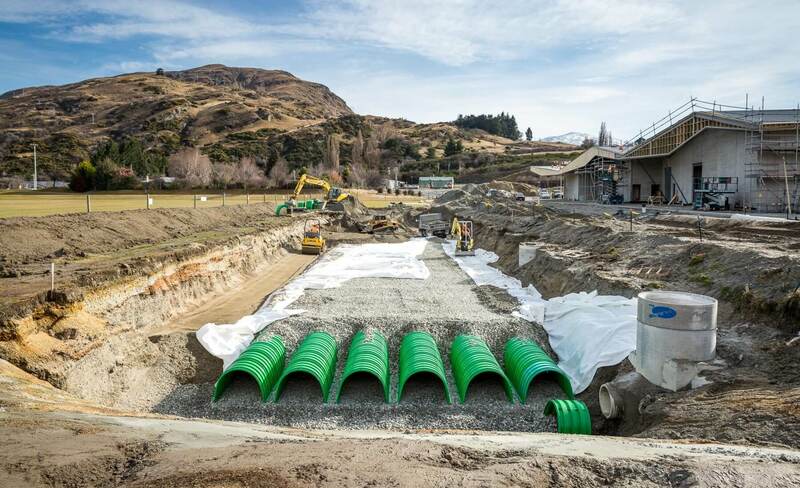 Outlet feeder pipes to the distribution rows are angled downward from the upper portion of the Main Header Row chambers, ensuring that the bulk of sediment has settled before stormwater is moved to the distribution rows. 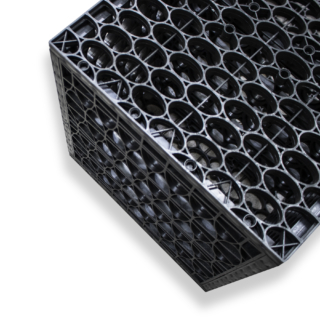 This prevents build up in the distribution rows and preserves the infiltration rate. The Main Header Row is designed to capture the ‘first flush’ and offers the versatility to be sized on a volume or flow rate basis to facilitate this use on most projects. 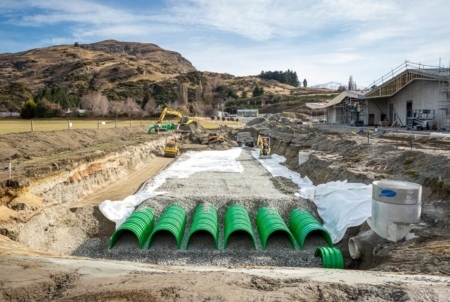 An upstream utility hole not only provides access but typically includes a high-flow outlet that controls excessive stormwater volume by discharging overflow onto surrounding stone or through a manifold to other Main Header Row chambers. 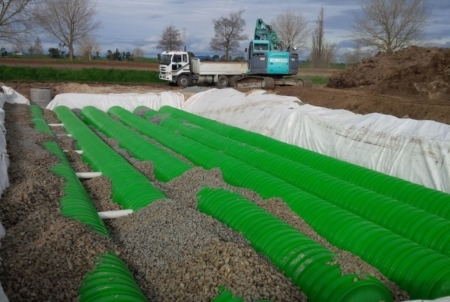 The sediment floors are designed to prevent scouring of the underlying stone and to stop sediment infiltration into the ground under the Main Header Row. The floors lock together and link with the chambers to remain engaged during high flow events and high pressure cleaning. Lightweight chambers weigh just 14.5kg each making them a one man lift. Exceeds the latest AASHTO LFRD Bridge Design Spec 1. Test validate chambers withstand a rear axle load of 21.77 tonnes. Made from eco-friendly soy-oil based resin. Can achieve up to 21 LEED credits. Cost-effective and has lower shipping costs. Fewer labour man hours per cubic meter. Soy oil based, a more stable cost that petroleum based. Easy to Install, only requires one person. 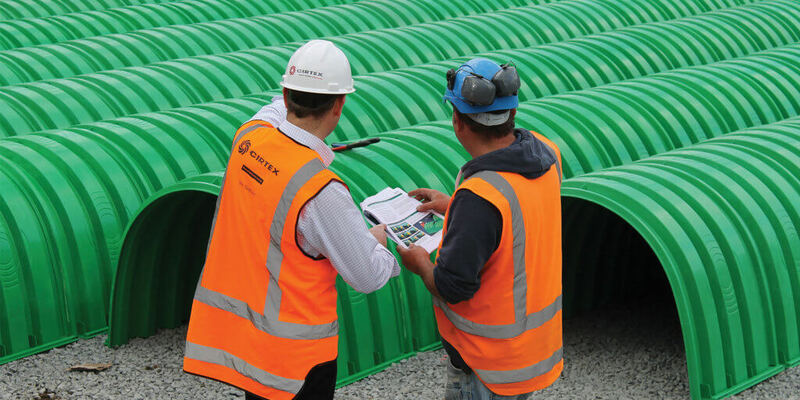 The engineered connection allows easy placement of chamber sections. 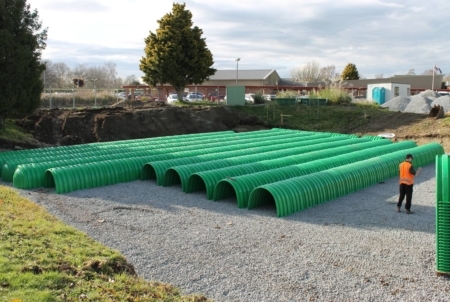 Deep installation – Can be installed with up to 15m of soil cover due to their excellent resistance to long term creep. 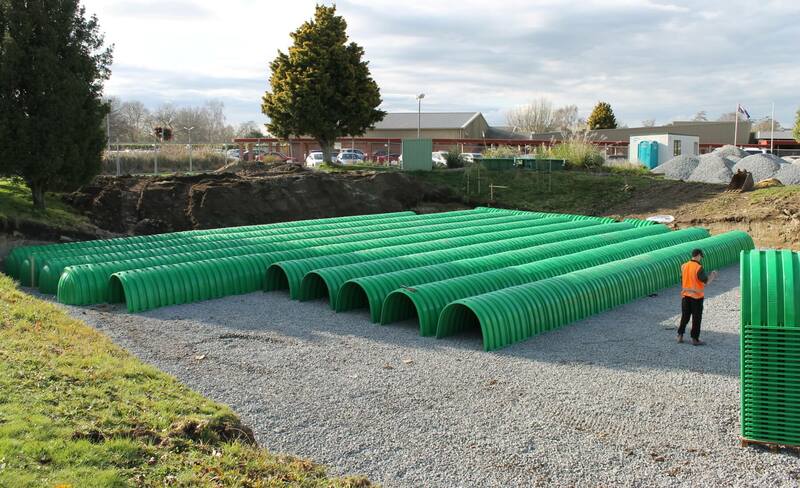 A comprehensive, low maintenance underground stormwater solution. 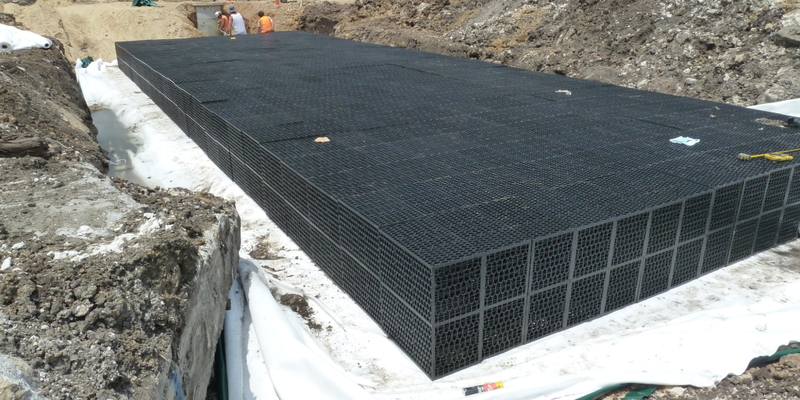 The Triton Stormwater Solutions system combines eco-friendly materials with an ultra durable yet lightweight design that is easy to install and maintain. It also saves on space, as the chambers can be double-stacked in many applications, reducing the footprint. 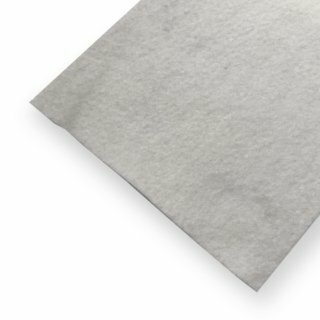 What is Triton made of? Triton Chambers are made of lightweight soy based resins.